Wendy Sharpe's imagery is deliberately evocative and open to interpretation, suggestive - but not prescriptive - of narrative, and characteristically expressive and ebullient. 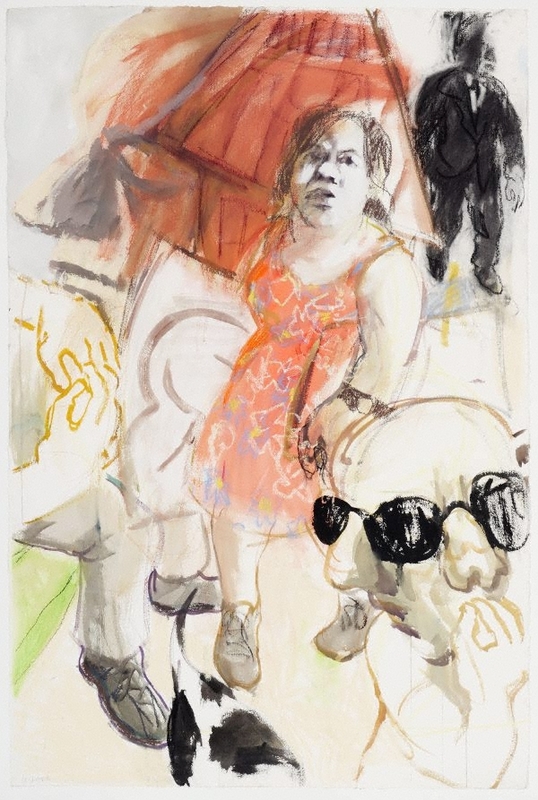 This drawing relates to a series of works shown at Philip Bacon Gallery, Brisbane in August 2007, in an exhibition titled 'Stories from the studio' (31 July – 25 August 2007). Sharpe made a gouache study and oil painting of the same subject: the artist in her studio surrounded by enigmatic figures. The quality and confidence of Sharpe's draughtsmanship is clearly evident in this particular drawing. In charcoal, pastel and ink it is less dependent upon the painterly use of gouache which has marked her work in previous years and therefore as a drawing, is the stronger for it. A drama of black and orange, centered upon the generous proportions of the female figure, 'Red dress' is one of Sharpe’s impressive recent drawings. This work was a finalist in the 2007 Dobell Prize and was acquired by the Gallery in 2007. Signed l.l. corner, pencil "W Sharpe". Not dated.